October 11th, 2014, from 1:00 - 4:00 p.m. Participants are invited to enter conversations with displayed artwork and bring them to life via words. We will begin with warm-up exercises, examples, and a variety of ekphrastic approaches. There will be a brief docent tour, as well as alone time to observe and allow specific artwork to inspire our words. To conclude, there will be a read-around to celebrate our new poems. Clarissa Jakobsons instructs a variety of art and writing classes at Cuyahoga Community College and at the Sage program at Akron University. She weaves art and poetry into artist books, which are internationally exhibited. A series of Camille Claudel artist books have been shown at the Cleveland Museum of Art - Ingalls Library. In another life, she taught art in the schools and initiated integrative art and writing programs for children and adults. Sample publications include Hawaii Pacific Review, Glint Literary Journal, The Poetry Forum, Kattywompus, Ruminate, Qarrtsiluni, Tower Magazine, Van Gogh’s Ear, The Yale Journal for Humanities in Medicine, and others. This event is free and open to the public. Participants will meet in Classroom A.
Workshop is limited to the first 24 registrants. Register by September 30, 2014. 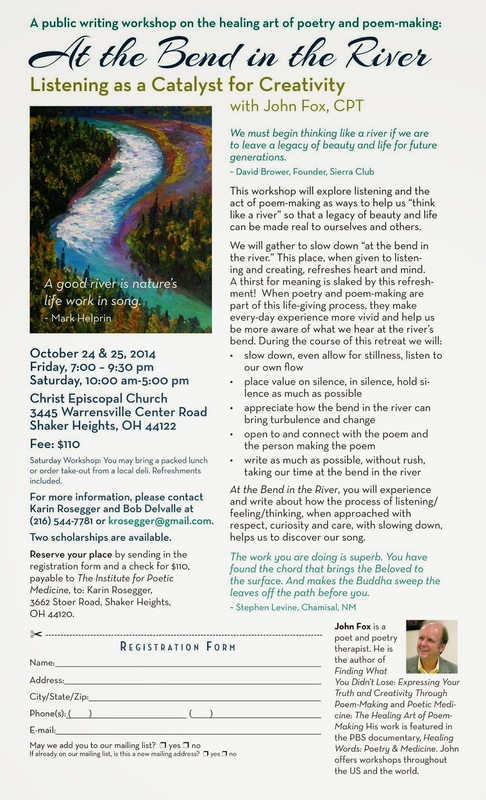 Send an email with your name and contact info to Chuck Salmons at charles@ohiopoetryassn.org or call (614) 829-5040. If using museum parking facilities, participants will have to pay for parking. Directions & Parking: http://www.clevelandart.org/visit/directions-and-parking. 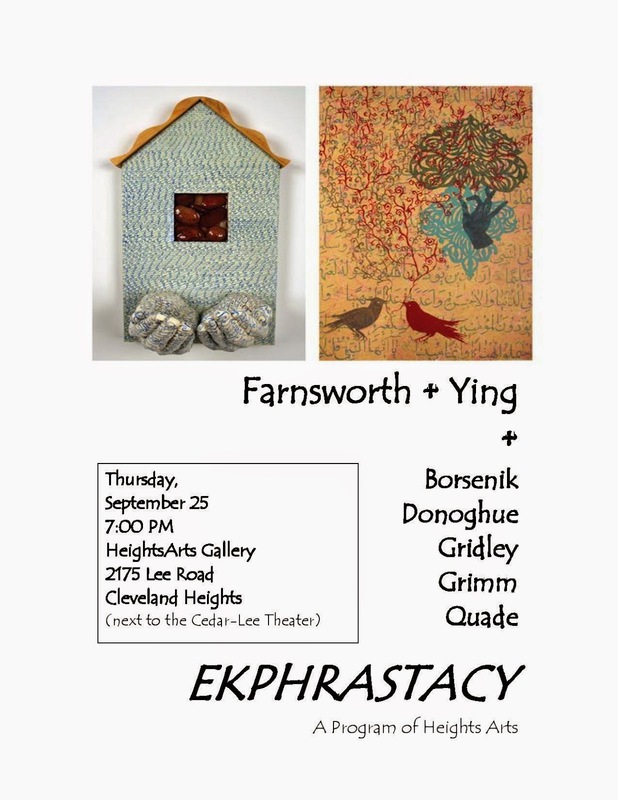 Join us for an evening with Isabel Farnsworth, associate professor of sculpture at Kent State University, and Hui-Chu Ying, professor of printmaking at University of Akron, who will share insights about their works on view in the gallery, artistic process and vision. Poets Dianne Borsenik, John Donoghue, Sarah Gridley, Susan Grimm, and Mary Quade will also read new works inspired by select sculptures and works on paper in the exhibition. FREE. 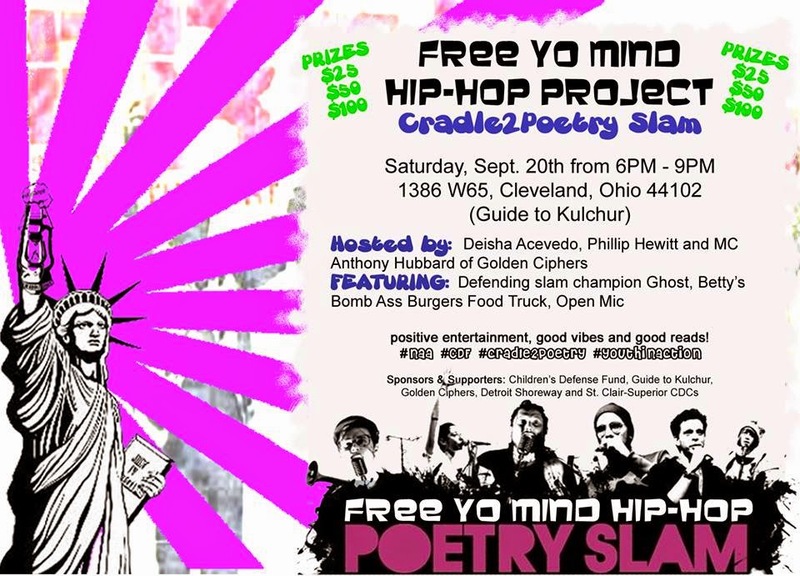 Guide to Kulchur and Children's Defense Fund / New Abolitionist Association (Ohio) would like to invite you to Free Yo Mind Hip-Hop Cradle2Poetry Slam, the funky-fresh poetry slam contest hosted by Cleveland's youth. Food, drink, $25, $50, and $100 gifts and prizes, plus special guest entertainment. FREE EVENT. COME SPIT DAT HOT FIRE! 1. No Props or Musical Accompaniment (must be a-cappella if you sing). 2. 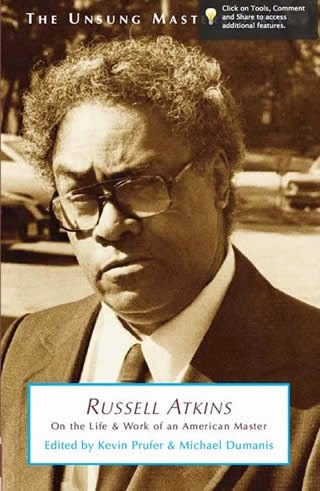 You must perform your own original poetry. 4. There are three knock out rounds so you must have three poems prepared to compete. Slammers or poets interested in reading during the open mic intermissions contact Joe: 216-650-1961, Deisha: 216-239-4409, or Philip: 937-238-4843 via phone or text. Winners receive $25 for 3rd, $50 for 2nd, and $100 for 1st place. More details, audience participation and slammer rules will be announced day of slam. Many of you already know Visible Voice Books is closing. I find it fitting that September is its last month. Today, while customers scramble for last minute deals (40% off). I sat admiring the wood interior of the store and appreciated the gated red bricked court yard. It made a statement beauty could be found anywhere. The store brightened up the street with an appealing grace and charm. What better way to spend a Friday or Saturday evening with a friend a glass of wine and live music in the background. Dave Ferrante presented a multi faceted entertainment venue. There was an eclectic book selection along with writing workshops (thank you Claire) combining for a wonderful atmosphere for art lovers of all shapes and sizes. Dave supported a women’s speaker series titled She Speaks. Regina Brett spoke there as well, presenting 50 Lessons about life. There were poets from Erie to California that performed in the courtyard or in a room upstairs. And can we talk about the wine tastings? This wasn’t a book store but a gathering place for unique thoughtful people. It’s a cool quiet Tremont night with church bells counting time. There’s sign on the door closing Sept 27th. I can feel the door swinging shut now as Brownbird sings Americana in the back ground. In the courtyard The Lost State of Franklin is setting up for their performance. It’s a good night for books and music. After all the experiences I’ve had here I’m glad to say thanks Visible Voice for a great deal on memories.